But he is perhaps best known for his swing-era dance numbers that were prominently featured in the 1977 play Zoot Suit, reviving his career in mid-life and earning him new fans among a young, activist generation of Chicano artists. The ground-breaking musical by writer and director Luis Valdez dramatized the persecution and fighting spirit of the so-called “pachucos” of the 1940s. "The play would not have been possible without his music," Valdez told me for the Los Angeles Times obituary I wrote when Guerrero died in 2005 at age 88. "So many focus on the negative side, but what Lalo captured was the joy of the pachuco experience, the playful vacilón, which no one else had done. That was something that was always unfailing with his work -- his great sense of humor and love for life." Eduardo Guerrero Murietta was born on “a bitterly cold Christmas Eve in 1916,” to quote an opening line from his 2002 autobiography, Lalo: My Life and Music. He was delivered at home in Tucson’s Barrio Libre (now known as Barrio Viejo), with only his aunts in attendance. The boy was named after his father, Eduardo Guerrero Ramirez, a boilermaker who had worked on steamships in the port city of Guaymas, Sonora. 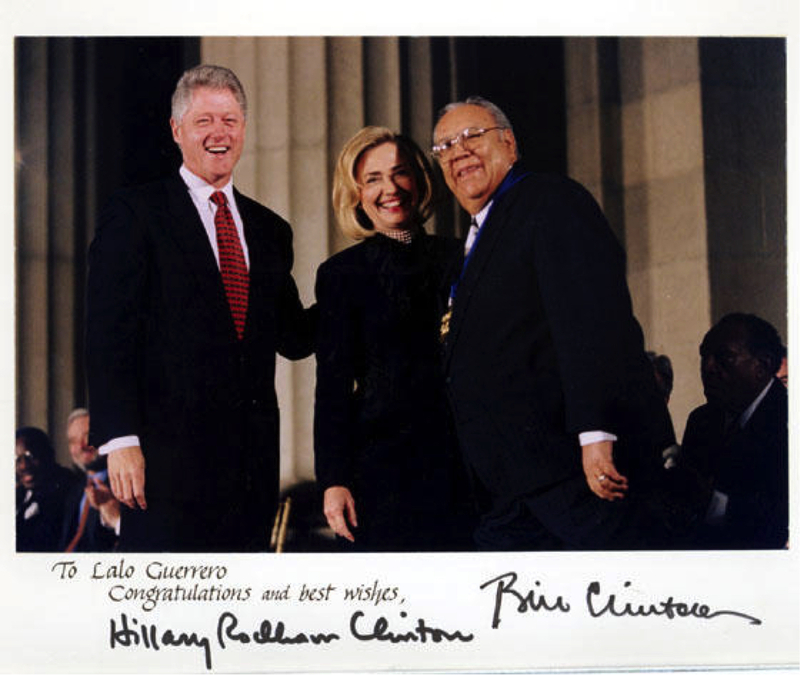 The elder Guerrero met and married Concepción Murietta in the historic mountain town of Cananea, site of violent labor strikes by copper miners in 1906. The couple was wed that same year, as street fights raged in town on the day of the nuptials. With the official outbreak of the Mexican Revolution in 1910, the Guerreros crossed the border into Douglas, Arizona, part of a massive wave of Mexican immigrants fleeing the civil war. Guerrero’s father used his experience on Mexican steamships to land a job with the Southern Pacific Railroad and soon became the head boilermaker. Guerrero draws contrasting portraits of his parents. His father was a stern disciplinarian who would beat him, sometimes naked, with a “special whip” of braided leather if he failed to do his chores. He wondered for decades why his father had been so harsh: “Maybe I just wasn’t macho enough for him,” he writes. On the other hand, he was his mama’s pet, a shy “crybaby” who looked to her for comfort and musical inspiration. His mother was always cheerful, he recalls. She would sing and dance to music on a Victrola as she did her house chores, clicking her Spanish castanets and kicking her heels up high, her long braids flying and her hair unfurling as she twirled around the kitchen floor. To the neighbors, she was the beloved Doña Conchita. To her son, she was an everlasting positive influence, the one who taught him to play the guitar “and to love it and to wrap my heart around it.” He calls that “her biggest gift” to him. The family’s Tucson barrio was so segregated, he writes, that the majority of Mexican-American residents never felt like a minority. Their ethnic community was on the wrong side of the tracks, but Lalo loved everything about it. He remembers the aroma of his mother’s freshly made, Sonoran style tortillas, the nature-boy thrill of swimming in the irrigation ditch, the singers serenading girls outside their windows, the mobile menudo vendors and the panaderías, the friendly waves of neighbors sitting on their front porches. 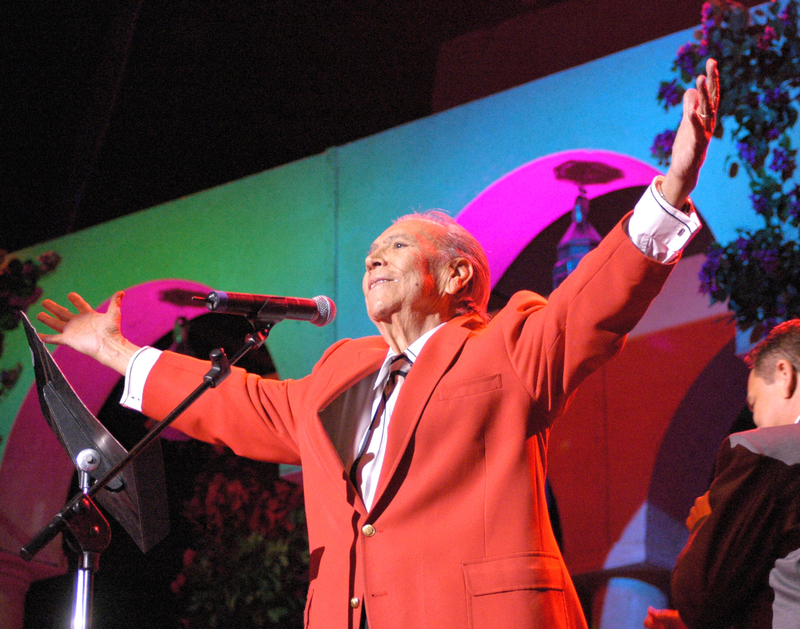 Years later, his nostalgia for the place would inspire one of his best known songs, “Barrio Viejo,” or Old Neighborhood, written “in memory of the world I knew as a child.” In the song, which he first performed in 1990, Guerrero laments the disappearance of the old barrio in the name of progress. Urban renewal plans in the 1960s called for the razing of many buildings, and a former Tucson mayor disparaged the area as a ghetto of "dirt, disease and delinquency." When he was five years old, Guerrero came down with a life-threatening case of smallpox, after his parents had refused the vaccination. The illness left him scarred for life, both physically and psychologically. He was “pockmarked and ugly,” he recalls, mocked by classmates with nicknames like Cacarizo, which means pitted or pockmarked, and Cara de Metate. The boy felt rejected and lonely. Yet, he still dreamed of becoming a romantic crooner some day, like his heroes Rudy Vallée and Al Jolson. Guerrero loved the movies, especially musicals with Gene Kelly, Ginger Rogers, and Fred Astaire. He’d watch a film five or six times until he memorized the songs he liked. He taught himself the piano when he was ten; the first song he remembers playing was W. C. Handy’s “Saint Louis Blues,” which was featured in a film starring Charlie Chaplin and another starring Bessie Smith. Guerrero credits his grammar school music teacher, Miss Davis, with encouraging him to perform and overcome his stage fright. Privately, the fifth-grader showed her how he had learned to tap dance by watching movies. Realizing her shy student’s desire to be onstage, she cast him in his first solo act, doing an Al Jolson impersonation for a school assembly. He felt transformed in his black hat, white gloves and black-face makeup, amazed that his scars were no longer visible. The following year, as a sixth-grader, he entered a citywide classical music contest, along with two other Latino classmates. When they won, nobody was more surprised than Guerrero. Despite the childhood traumas, Guerrero continued to explore his love of music, in all styles, Spanish and English. In equal parts, he loved Bob Wills and his Texas Playboys as well as Pedro J. Gonzalez and Los Madrugadores (the Early Risers). For hours, he’d stand at the window outside of The Beehive, a local bar patronized by blacks, absorbing the blues and swing styles that would play so prominently in his career. “When it came to music, I was a funnel,” he writes. Later, Guerrero started a duo which he considered his first professional experience because he actually got paid. 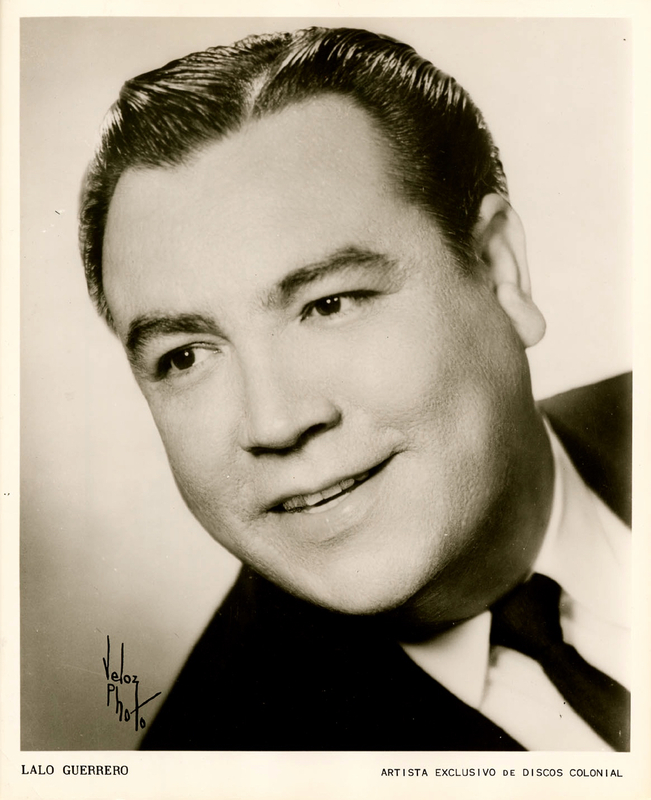 He was a tenor and his younger partner, a neighborhood kid named Joe “Yuca” Salaz, was a baritone. They played guitars and harmonized beautifully, earning 25 cents an hour at first, raised to 50 cents when they got popular. Eventually, the duo doubled, adding Yuca’s older brother Chole Salaz, and Greg “Goyo” Escalante. Now a popular quartet – four singers with four guitars – they started playing weddings, anniversaries and quinceañeras. They also performed regularly on local Tucson radio station KVOA, the Voice of Arizona. One of their customers was a friend of Guerrero from high school, Gilbert Ronstadt, whose family owned a hardware store in town. Ronstadt had a young daughter who was thrilled to hear the music whenever the group came by his house to visit. Even at late hours of the night, the girl would rush downstairs to hear them play, sitting cross-legged on the floor, still in diapers. Her favorite song was “La Burrita,” about a little female donkey. Many years later, Guerrero says he was surprised to hear her on the radio singing English pop music. The little girl with the big eyes had become a big star, Linda Ronstadt. In 1996, they sang “La Burrita” together at the Tucson International Mariachi Conference, with Ronstadt still doing the clip-clop sounds with her mouth, just as she had as a girl. 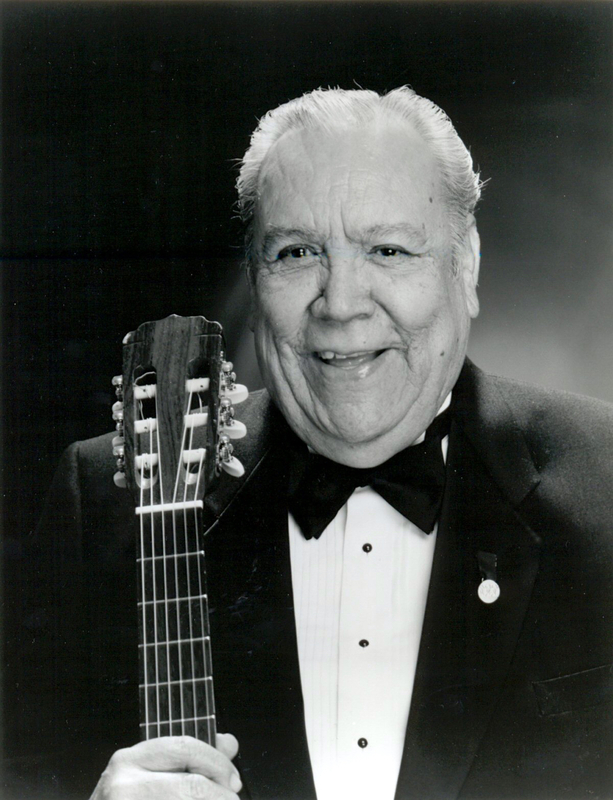 At 17, Guerrero wrote one of his most famous songs, “Canción Mexicana,” incorporating traditional melodies in an ode to the country and its culture. He calls it “the most enduring song” in his repertoire. Despite his patriotic fervor, Guerrero had not yet been to Mexico. When his family briefly moved there, it was both a shock, and a cultural eye-opener. But the visit also opened new musical vistas for the aspiring artist. Guerrero also found a new musical idol, the revered composer Agustín Lara. He bought a notebook and wrote down song lyrics so he wouldn’t forget. “My music would never be the same,” he writes. For Guerrero, it was another abrupt dislocation requiring more adjustments. By then, his class had graduated and he refused to return to finish with younger students. So, he didn’t earn his diploma. Twenty years later, when he was well-known as an artist, he performed for an assembly at Tucson High School, and the principal surprised him with an honorary degree. After returning from Mexico, Guerrero started playing again with his quartet, now under a new name, Los Carlistas. They got the name from a local youth club which itself was strangely named for an obscure, 19th century pretender to the Spanish throne, Prince Carlos. Guerrero never liked the name, nor having to explain it, but it was chosen by majority vote. 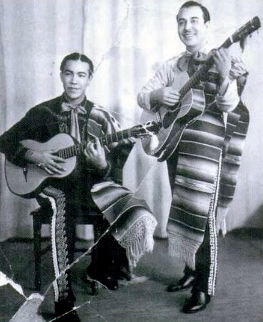 The band was so popular they started getting invitations to play “some fancy places” after being “discovered by the other side of town – the white folks.“ Seeking a wider audience, they were soon encouraged to move to Los Angeles by Frank Robles, a rabble-rousing state legislator from Barrio Viejo, who would become their manager. Robles got the group gigs on a popular morning radio show in L.A. and at local venues. 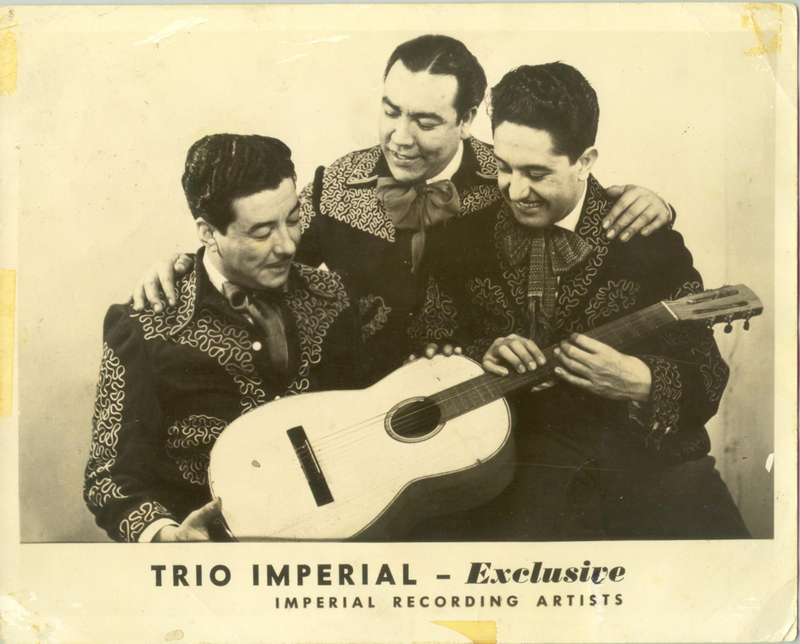 They performed live at the historic California Theatre, now demolished, where they rubbed elbows with recording stars they admired, such as Las Hermanas Padilla and the duo Chicho y Chenco of Los Madrugadores. When the group was booked to play Omar's Dome, an exclusive Hollywood nightclub, they were too broke to buy costumes. So they improvised a peasant look, buying yards of white muslin to sew shirts and pants with draw strings at the waist, making ponchos out of curtains and huaraches from old tires. They topped it off with straw hats from F. W. Woolworth. Los Carlistas wore those very same costumes when they appeared in the 1937 film Boots and Saddles, starring Gene Autry. Although their part is uncredited, when the film played in Tucson, the band got marquee billing above the famous singing cowboy: Starring Los Carlistas with Gene Autry. At the time, a wide variety of Latin music styles – from samba to tango, mambo to mariachi, conga to flamenco – was gaining widespread popularity among mainstream audiences. 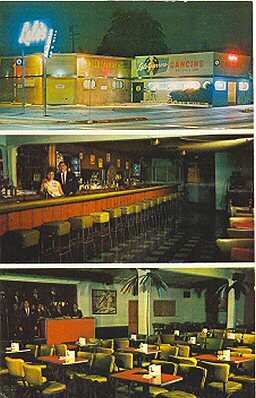 At the popular Club La Bamba, near Olvera Street in the heart of the city, Guerrero and the quartet serenaded the mostly white customers, strolling around their tables between floor shows. The place would become a hotspot for emerging Hollywood stars. Guerrero watched one of these stars emerge on the La Bamba dance floor. She was part of a father-daughter show team known as the Dancing Cansinos, Eduardo and Margarita. Guerrero claims a bartender there invented the famed tequila cocktail and named it after the lovely Margarita, although others also take credit. Be that as it may, the young performer went on to become a huge Hollywood star under her stage name, Rita Hayworth. Despite the gigs and the glamor of L.A., the Depression was still on and money was tight. Guerrero took a day job trimming the lining out of old rubber tires, a job that left cuts on his arms and hands. But his luck was about to change. A chance encounter on a downtown street would take his career to the next level. Guerrero was walking down Main Street when a stranger, attracted by his fancy cowboy boots and white hat, stopped and asked where he was from. 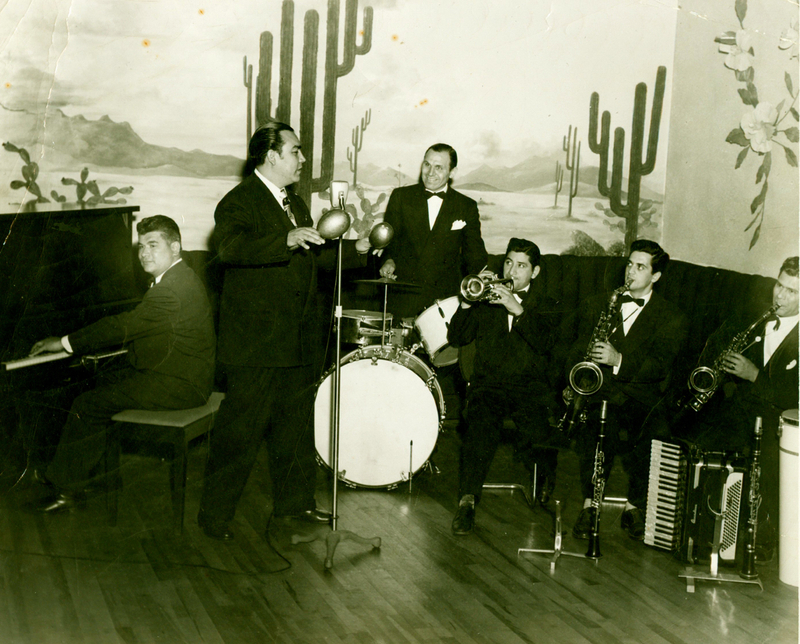 That man turned out to be the famed composer and producer Manuel S. Acuña, who like Guerrero had roots in Sonora. Their serendipitous meeting was the start of a long and fruitful recording collaboration. 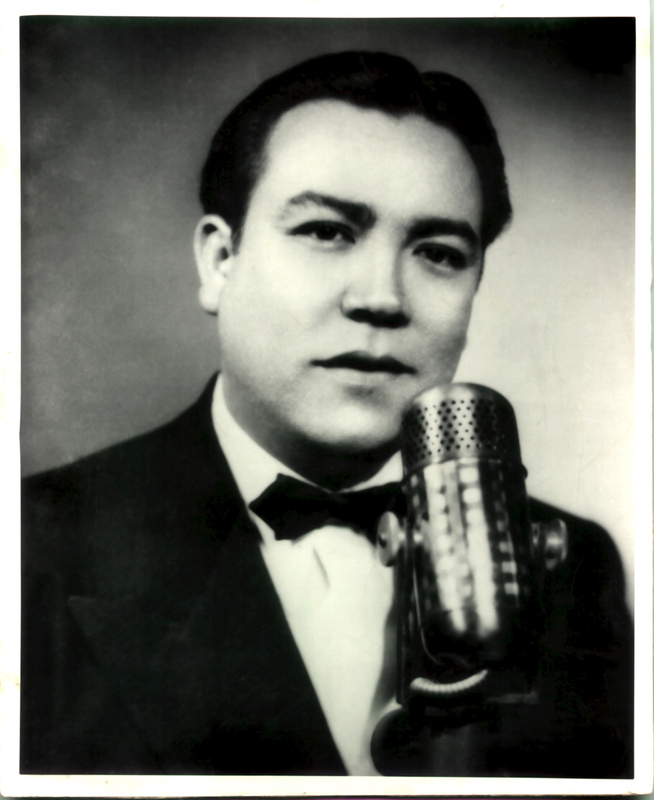 Acuña worked as the A&R (artist and repertoire) man for Vocalion Records, located nearby. 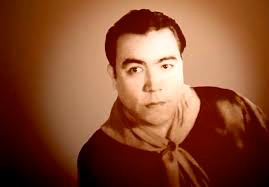 At Acuña’s request, Guerrero later delivered three songs to Acuña’s partner, Felipe Valdes Leal, another legendary producer of Mexican music. 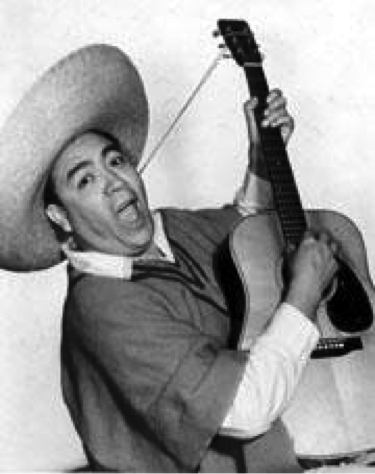 To his amazement, Guerrero later learned two of his songs would be recorded by the hugely popular Hermanas Padilla. Those would be Guerrero’s first recorded compositions. The Frontera Collection contains the two songs on a Vocalion 78, recorded August 25, 1938, featuring the Padilla sisters with accompaniment by Los Costeños. 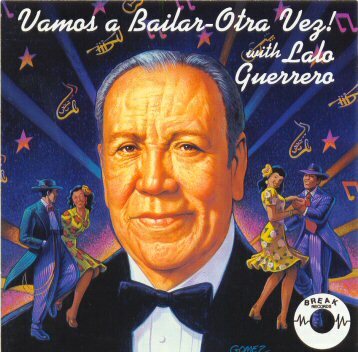 The disc includes “El Norteño” (The Northener) backed by “Estamos Iguales” (We’re Even). However, only one side is credited to Guerrero. 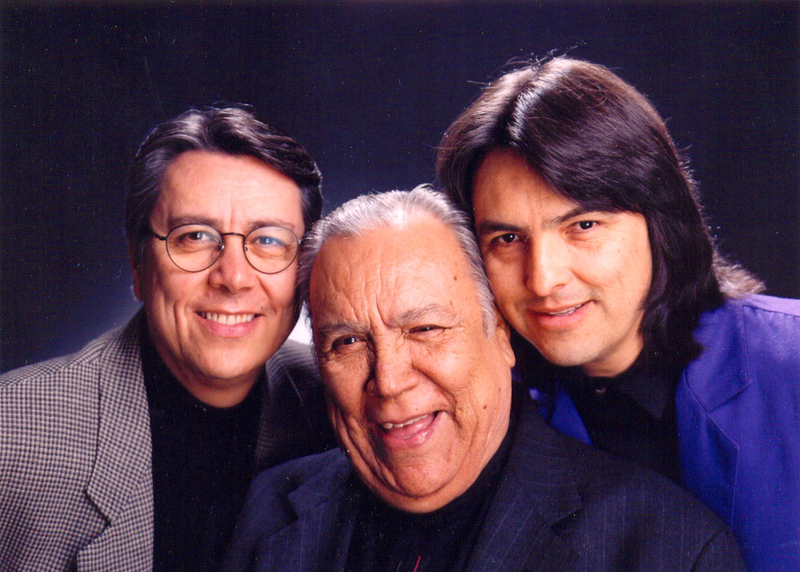 The label credits Acuña and Leal as songwriters on “El Norteño,” despite Guerrero’s claim that Acuña had given him a contract for both songs. 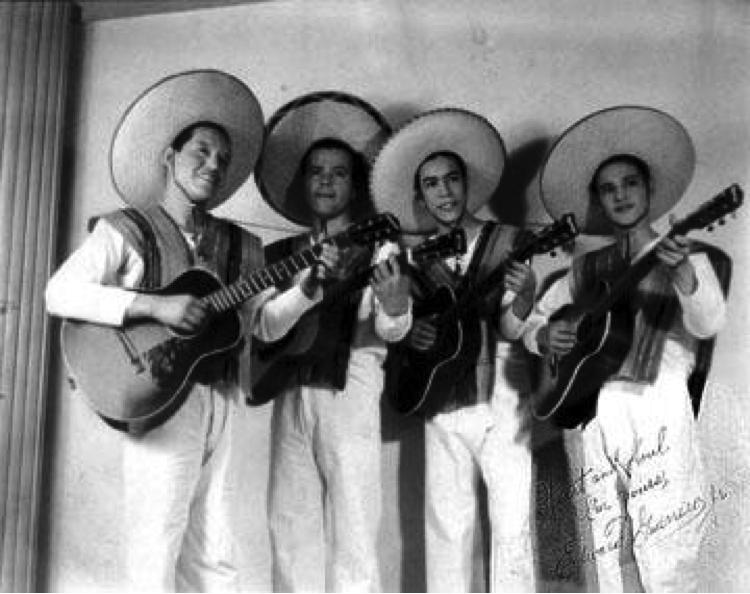 Frontera has all four of those early songs by the group on Vocalion 78s, all credited to Guerrero. One is “El Aguador,” a huapango, backed by “Cuestión De Una Mujer,” identified as a Canción Fox. The other disc features “¿De Que Murio El Quemado?” (What Did the Burned Man Die Of?) backed by “Así Son Ellas” (That’s the Way Women Are), the latter co-written with Chole Salaz. Los Carlistas went on to record a dozen more records in the next few months. 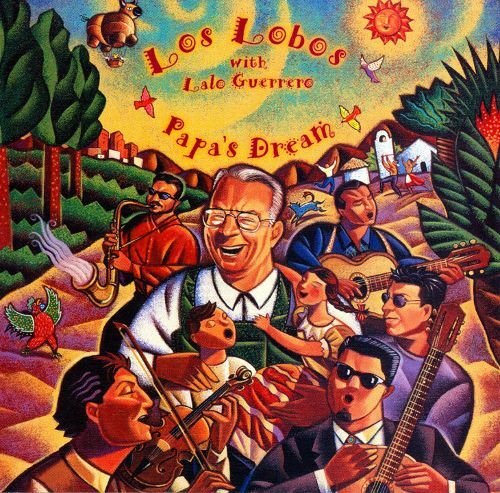 In those early works, Guerrero establishes the stylistic range that would mark his life’s work: humorous and romantic, folkloric and cosmopolitan, upbeat and slow tempo. His trademark became his versatility. Soon, he’d be adding English and Spanglish to his lyrics. The following year, Guerrero married his first wife, Margaret Marmion, the daughter of a hotel maid whose father had passed away. They had met at a friend’s wedding four years earlier, when he was 19, and she was 16. He serenaded her at the reception and asked her to be his girlfriend. The wedding date – October 15, 1939 – had been announced at church in Tucson, but Guerrero worried he wouldn’t be able to pay for it. He had promised his bride-to-be that he would work in Los Angeles to raise the money, but it wasn’t easy. 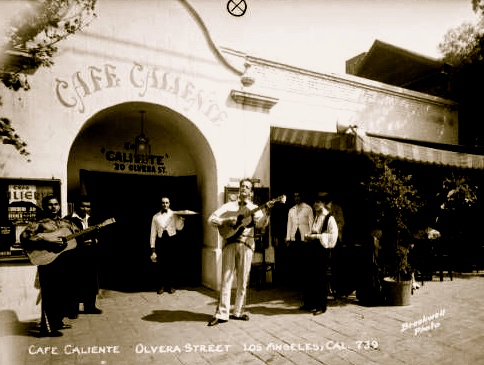 His quartet had disbanded so he teamed up with another musician, Lupe Fernandez, and the duo started playing at Café Caliente on Olvera Street. By that time, he had forgotten all about the recordings made by Los Carlistas for Vocalion the year before. Then one day, Acuña, their producer, dropped by the club to tell Guerrero he had a royalty check waiting. He was shocked to learn the amount: $500. It was enough for a wedding dress and a fiesta, so he headed back to Tucson to get married. Many years later, Guerrero found the lyrics of a song he had written for his wife. The words were on a piece of paper with a sketch of a charro he had drawn, but he couldn’t remember the melody. He didn’t know how to write music and he had no tape recorder, so the song was lost. At this point, Guerrero had already written many other songs. So he decided to make a trip to Mexico City to get them recorded. The Mexican publishers liked the songs, but not the singer. They considered the U.S.-born Guerrero a “pocho,” a derogatory term for a Mexican who’s been Americanized, tantamount to a cultural traitor. It was a frustrating effort for the artist who considered himself “as good a tenor as anybody," as he once told a reporter. He finally sold four songs to PHAM, Promotora Hispano Americana de Música, a publisher associated with Southern Music in the U.S. He came home, waited, wrote letters. No response. After many months of inactivity, his high hopes that a star would record one of his songs were dashed, at least for the time being. 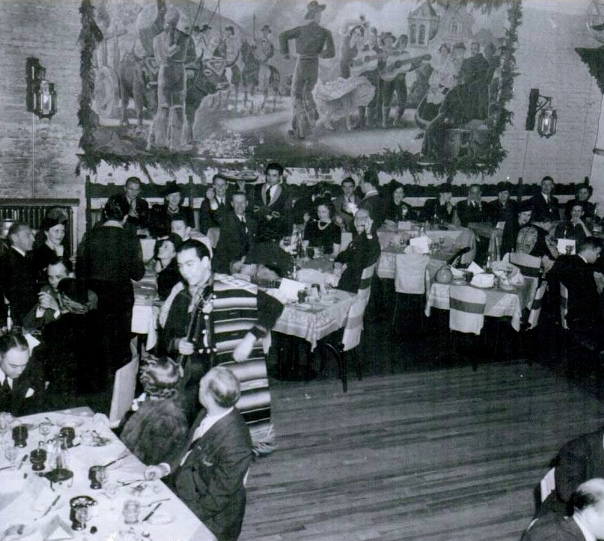 That busy year did bring a career high point, when Los Carlistas were chosen to represent Arizona at the 1939 New York Worlds Fair, which opened in April. They swapped their peasant outfits for black charro suits with silver trim, proudly promoting the state, and its warm climate, along with other iconic cultural symbols – desert cactus, Hopi pottery, and Navajo blankets. The fair’s theme was “The World of Tomorrow.” At 19, Guerrero saw television for the first time, with tiny sets on display at the RCA, General Electric, and Westinghouse pavilions. And he marveled at a mockup of a future freeway, a decade before the first one was built in Los Angeles. The climax of the trip was the group’s appearance at Radio City Music Hall, on the nationally broadcast show, The Major Bowes Amateur Hour. They sang “Guadalajara,” and got paid $10 plus an all-you-can-eat pass to a cafeteria across the street from the studio. For Guerrero, the big thrill was “following in the footsteps of a boy who would be both a hero and a friend 50 years later.” He’s referring to Frank Sinatra, who had gotten his start in show business on the same show in 1935. 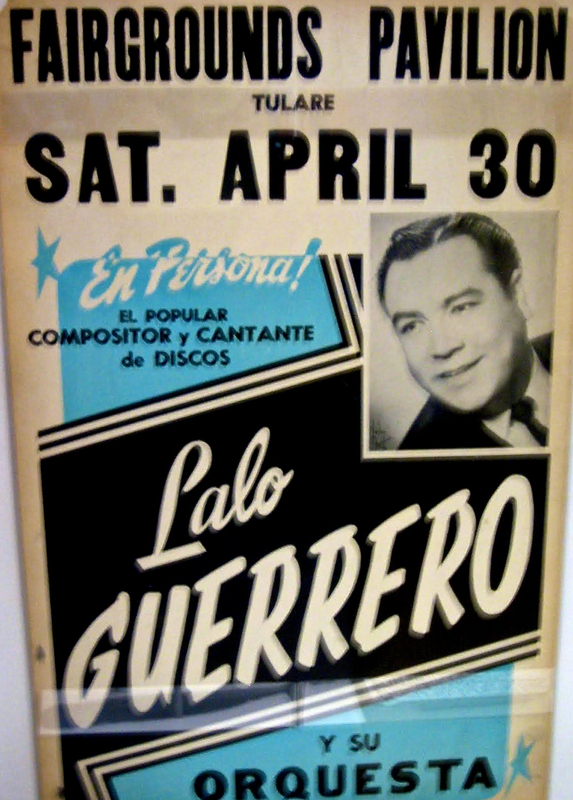 Guerrero always believed that his race – what he called “my dark, ethnic looks" – kept him from breaking into the American pop mainstream as a singer. But he was destined for a different breakthrough – as the country’s first Chicano star. 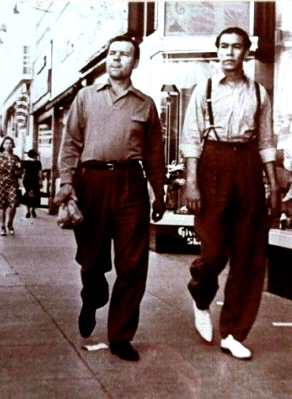 Guerrero developed his bilingual/bicultural identity in the crucible of racial conflict at home during World War II, when U.S. servicemen attacked Mexican-American youth on the streets of Los Angeles. 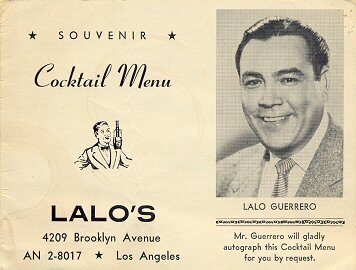 Guerrero, who was among the persecuted victims in the so-called Zoot Suit Riots, emerged as the voice of his generation. His snappy, swing dance tunes, peppered with pachuco street slang, would finally put him on the pop culture map.